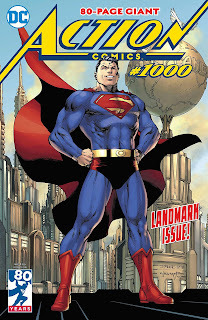 Action Comics #1000 has arrived. It's a comic that at some points seemed very far off, at other points I wasn't sure we'd ever see. When the New 52 restarted Action's numbering, it seemed the idea that high numbers put off new readers might be extending even so far as DC's longest running titles -- but around the time DC recognized Detective Comics #900 amidst the New 52, we got an inkling the renumbering was not so cynical as we thought. And now, of course, here we are, and with the Superman title about to be renumbered to #1 too, we get an Action and Superman in sync with at least their right-most digit, which leaves neither title looking so old after all. If we didn't know better we'd think they planned it this way. It is nice to see old friends represented. Dan Jurgens looks stellar here, drawing a good swath of the current DC Universe with inks by Norm Rapmund, and also Jerry Ordway drawing and inking himself, with script by Louise Simonson. Rightly DC also nods to their current stable, Geoff Johns and Scott Snyder and Tom King and, of course, Brian Michael Bendis. There is surely no way to fit every influential Superman writer over the past eighty years in here, but we see between the pages John Byrne, Mark Waid, and Jeph Loeb, among others. Among strong stories here is Snyder and Rafael Albuquerque's, who nod to perhaps comics' most famous rivalry, that of Superman and Lex Luthor. Indeed Snyder's "frenemies" take on Clark Kent and Lex Luthor's Smallville friendship versus the hero/villain conflict nods to canon and also Waid's Birthright and Johns' Secret Origin. The suggestion of peace between the opponents after eighty years is certainly fitting. Tom King and Clay Mann also do well in a tale of Earth's final days. King ducks what would have been the easy maudlin route, a lonely Superman mourning the loss of everything he knows, by having both Lois and Jon alive with him millennia into the future. Instead, this is an ode to Ma and Pa Kent (fortunately, because they don't otherwise make the stage here), but moreover, Superman's relationship to Earth -- that he largely sees himself from Earth, that he's been a hero of all of Earth, that most people's idea of Superman include flying through a blue sky under a yellow sun. This too is a fine distillation of one of Superman's essential parts -- both Earth and the Kents -- worthy of mention in his one-thousandth issue, and one of the book's tear-jerkers. Brad Meltzer has one of the best lines in his story "Faster Than a Speeding Bullet" with John Cassaday, when a hostage who helps Superman with her rescue jokes, "I just did what Batman would." There is a surprising dearth of Batman in this book (made up for perhaps by some nice Batman moments in the Action Comics: 80 Years of Superman hardcover) and Meltzer's jibe is a good-hearted reminder of the competition between the two comics properties. The levity aside, Meltzer's story is harrowing, both in its laser-sharp focus on an impending bullet and the implication that Superman might not save the woman, one of the few pulse-pounders among mostly tribute stories. I would give top prize for the book to Johns and Richard Donner (with art by Olivier Coipel), however. In examining Action Comics #1 in the 80 Years book, I noted the uncomfortable sequence in which Lois rejects a man, Butch, at a club, and then Butch and two friends kidnap Lois and drive off with her for purposes unstated (a sequence more heinous, it seems clear, than Jerry Siegel and Joe Shuster likely really understood). Johns and Donner pick up with Butch and his ruined car (from the Action Comics #1 cover) at the mechanic, just in time for Superman to arrive and, in two pages, talk Butch into changing his ways. Though Johns and Donner, too, do not give adequate weight to Butch's crime, their reach back to this idiosyncratic moment is the perfect thing for Action #1000. Given that Superman wrecked Butch's car and knocked he and his friends around a bit, that Superman saves the day here just through conversation is a nice counterpoint. The story is among the book's most complete, and in five pages that's a hard task. A lot will no doubt be written about Brian Michael Bendis' Superman debut in these pages. In the main I take seriously Bendis' role in the significant reversal of Marvel Comics' fortunes over the past two decades; whether one enjoys or not Bendis' signature style, he's obviously a writer with some capability, so I'm inclined to reserve judgment for more than just his inaugural story. I will say I was pleased to see Supergirl's outsized role in this story, which puts to rest some concerns that Bendis might proffer a stripped-down version of the current Superman status quo that would also sideline Jon. Additionally, a lot is being made online of the last page twist in which new villain Rogol Zaar reveals he destroyed the planet Krypton, apparently in collusion with Jor-El. I would dispute that last part; Zaar's dialogue is, "But this is it ... the Kryptonian sickness finally ends today. Just like I once promised Jor-El ... when I destroyed the planet Krypton," which I read to mean that Zaar had a similar battle with Jor-El and "promised" him that Zaar was ending the Kryptonian "sickness." It's not that Jor-El was in agreement, just that Zaar made the same statement to Jor-El that he's making to Superman. I was glad to see, in a page from Man of Steel by Jason Fabok that was tweeted by Bendis, an image of the Mr. Oz Jor-El; the very best thing that could come of Bendis' run is that it is not a full stop new direction, but that actually the mystery of Zaar and Krypton could be related to (or at least mention the coincidence of) The Oz Effect and Rebirth, since it doesn't seem Dan Jurgens will be able to bring that to much of a conclusion. Among decades covers on Action Comics #1000, I thought Joshua Middleton did particularly well with a 1980s cover that didn't rest on Christopher Reeve photorealism, though one would recognize that Margot Kidder-style Lois Lane outfit anywhere. Dan Jurgens' 1990s cover, with Kevin Nowlan, is less '90s specific than I might have liked, but I'll be darned if that logo variant didn't bring back some memories. Action Comics #1000 is an issue that's caused a lot of people to talk about Superman and that's a good thing, and we know it's less than a year before people will be having the same conversations over again about Batman. Eighty years later and you can still go to a store and buy a Superman comic; you will believe a man can fly, indeed. Anyone know how or in what will Action 1000 be collected? A deluxe edition briefly showed up in a catalog last month, with a September release date, and then the listing disappeared. I still don't get why DC won't just include it in the last volume of Jurgens's run. I assume it'll get split up a bit and/or there will be some double dipping. The Bendis story will certainly appear in the Man of Steel collection. Jurgens' story will probably appear in his last collection, same w/Tomasi and Gleason. 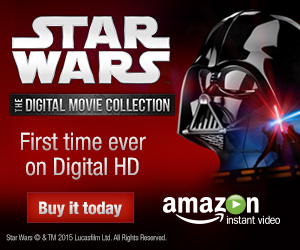 I assume we'll get that Deluxe Edition for Christmas (along w/a tpb of the 80th anniversary special). No inside information - just seems like the right thing to do. I'm super excited for 'Tec 1000 in March (give or take). It'll be fascinating to see what Batman stories are and are not included since Batman is often the "main" title and the big events happen there.